Pompeii is not just an excavation, it is a whole city. There are two theatres, a large amphitheatre, countless snack bars along the streets, several bathhouses, shops, gracious villas, at least one brothel, town houses and apartments, temples and law courts, various markets and recreational areas. 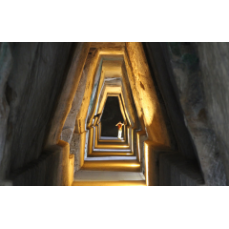 All were buried in volcanic ash 1,920 years ago. 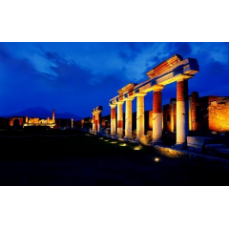 Pompeii, whose name is of Oscan origin, was founded by Italy people, probably during the 8th century BC. 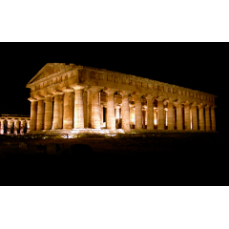 During the 6th century BC the nearby Greek settlements of Cumae and Neapolis exerted a strong influence. Remains of this date include the Doric temple in the triangular forum. From 530-474 BC Pompeìi was occupied by the Etruscans, and soon after this the first stone walls were built around it, replacing an earlier earthwork defence. The period from the late 5th to early lst centuries BC is generally referred to as `Samnite Pompeii', but it was in reality a troubled period during which both Samnite and Roman influences were strong. By the late 3rd century BC Pompeii had been admitted into the Roman federation, though the inhabitants were Italic. The defences were elaborated as the town had expanded, and public buildings such as baths, forum, theatre and more temples were added. During the Social Wars of 92-89 BC Pompeii joined the Italic League to protest against Roman oppression. It was at this time that the towers were added to the defences, which helped the town to withstand a siege by Sulla's forces in 90 BC. 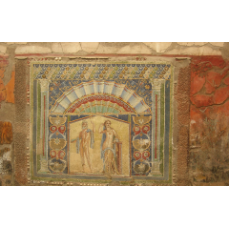 The region was eventually won back to Rome, and in 80 BC a new colony, was established - Colonia Veneria Cornelia Pompeii. More public buildings were constructed to meet the needs of the colonists, doubling the number of temples, baths and theatres; an amphitheatre was added and, a little later, an aqueduct. Situated about 400m from the sea, with a small harbour at the mouth of the River Sarno, Roman Pompeii grew in importance as a trading centre. Fulling and baking seem to have been the most prolific industries, and inns, bars, taverns and stables abounded to serve visitors and inhabitants alike. Population estimates for AD 79 range from 12,000 to 20,000, and the houses reflect great variety in fortunes: some were wealthy enough to take up an entire district( insula), others had only a few rooms. 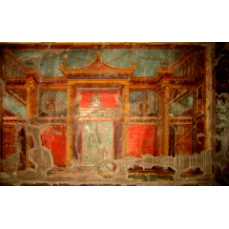 Significant events for the Pompeians took place in AD 59, when riots in the amphitheatre caused its closure for 10 years, and AD 62, when there was a terrible earthquake. Soon after this, perhaps as compensation for both events, the emperor Nero bestowed the honour of his name on the town, Colonia Neroniana. 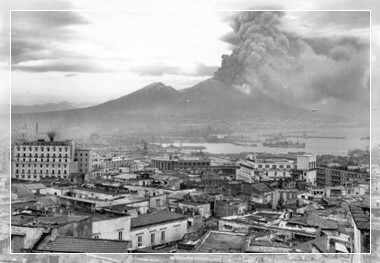 About 2,000 inhabitants are thought to have perished in the town during the eruption of Vesuvius. Titus had become emperor only two months before, and initiated relief for survivors. Some attempts were made to disinter the town, but the task proved too great, and too dangerous - pockets of escaping gas caused further deaths. The site was abandoned, although a small settlement called Civita did grow up over the ash, just to the north.. Further eruptions of Vesuvius led to its desertion in the 11th century, and the exact position of Pompeii was forgotten. Roman remains had been unearthed between 1594 and 1600 during 'the construction of the Sarno Canal which crossed the site of Pompeii, but their significance was not recognised. Then, in the early years of the 18th century, monks sinking a well in Resina, the town that had grown up over Herculaneum, began bringing to the surface rare and beautiful marbles. They had unknowingly struck the upper tier of seats in the theatre. A wealthy Austrian, Prince d'Elbeuf, heard of the treasures and commissioned a programme of looting by means of lateral tunnels dug from the well shaft to provide ornaments for his new villa. Tunnelling and looting at Herculaneum continued during the period of Bourbon rule in Naples from 1734, and in 1738 an inscription was found which identified the site. Charles III appointed an army engineer, Alcubierre, to oversee operations, and Herculaneum soon resembled an anthill. By 1748, removable treasures were becoming scarce, and Alcubierre switched his attention to the area of Pompeii. The town' was not identified until 1763, when an inscription with its name was found. Alcubierre made no ' record of his finds, but fortunately his assistant, Karl Weber, was more methodical, and some plans were drawn, especially of the Villa dei Papiri, just outside Herculaneum. Throughout the 18th and early 19th centuries `excavation', in reality looting, continued sporadically at both Pompeii and Herculaneum. The art and architecture had a profound effect on western culture, as a revival of classicism swept the educated and fashionable. It was not until 1860, when Garibaldi appointed Giuseppe Fiorelli as director of excavations at Pompeii, that anything resembling modern archaeological techniques were applied. Fiorelli instituted a policy of completely clearing one site before moving on to the next, and leaving finds in place wherever possible to preserve their ancient context. He recorded his excavations in journals, and it was he who first realised that the body cavities in the ash at Pompeii could be reconstructed as plaster casts. He divided the streets up into numbered regions, and gave each insula and each doorway a number. This system of identifying each building is still used today - eg I, 6, 15 refers to Region I, insula 6, doorway 15. Other scholars continued his work. From 1875-1900 August Mau, a German, worked at Pompeii. 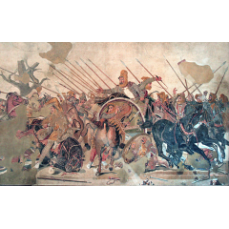 Amongst his achievements was the recognition of the four successive styles of wall painting stili referred to today. From 1910-1923 Vittorio Spinazzola oversaw a project to uncover the entire Via dell' Abbondanza, published in 1953 in three huge tomes. 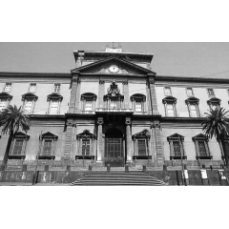 His successor in 1927 was Amedeo Maiuri, who also began the first systematic excavations at Herculaneum. (Ray Laurence Roman Pompeii Routledge 1994, quoting Professor A Wallace Hadrill). Behold Vesuvius, once covered with green vineyards, producers of fruity wines: This is the mount that Bacchus loved better even than the hills of Nysa and on which the satyrs wove their dances. And here was Herculaneum, which vaunted the name of the hero Hercules. Everything lies under the flames and glowing ashes. Vesuvius in the lst century AD was a pleasant green hill, with pastures, orchards and vineyards spreading up its sides. It had not erupted for over a thousand years, and no-one dreamed that it was active, despite the proximity of the obviously volcanic Phlegrean Fields about twenty miles away. Those who noted its volcanic shape, like Strabo the geographer who climbed it in the early years of the century, concluded that it was long dead. A warning of the pressures building up beneath the cove carne in AD 62, when a violent earthquake occurred, with Pompeiì very close to the epicentre. The town was extensively damaged, -and repairs were still being carried out 17 years later when a greater disaster struck. Early in August of AD 79 tremors again shook the countryside around the mountain. A number of wells dried up and springs ceased to flow - a symptom of the pressure building up within the earth. During the night or early morning of August 23rd/24th, ash began to issue from the volcano, and at about 1.00pm on the 24th, the plug of solidified lava that had sealed the crater for so long was blown to fragments in a spectacular explosion. An eye-witness account of the eruption is provided in two letters written 26 years later by the Younger Pliny to the historian Tacitus. He describes the final hours of his uncle, Pliny the Elder, commander of the fleet at Misenum, who had sailed towards the eruption, first to observe and then to assist with rescuing survivors. He died at Stabiae, either overcome by fumes or as the result of a heart attack. We could now see a black lowering cloud, torn by a blast of fire that furrowed it with rapid zigzag lines, and as it opened it disclosed long trails of fire, like forked lightning, only much larger. Soon afterwards the cloud carne down and covered the sea and hid the Isle of Caprea from sight. The promontory of Misenurn disappeared... and a shower of ashes began _to drop; then total darkness fell over all. During the first phase of the eruption, called the Plinean phase after the accurate account given by Pliny the Younger, a huge cloud of ash, pumice and gases was thrust 20km into the air. The prevailing wind carried this towards Oplontis, Pompeii and Stabiae, which were showered with pumice and ash. Herculàneum suffered much less at this stage. This was followed by a series of violent ground surges, travelling up to 100 km per hour, of volcanic ash and hot gases, causing many deaths by dry asphyxiation. Almost immediately after each carne pyroclastic flows - hot, chaotic avalanches of pumice, ash and gases mixed with limestone, volcanic rocks and mud eroded from stream beds. Because of the local topography, Herculaneum was buried to an average depth of 20m, whereas Pompeii, already covered by airborne pumice and ash, suffered much less. The absence of any red-hot lava meant that the towns, whilst buried, were not destroyed, but preserved beneath the new ground level. Vesuvius after the eruption. Its sides have fallen in to form a vast crater about 11 km4s in circumference. 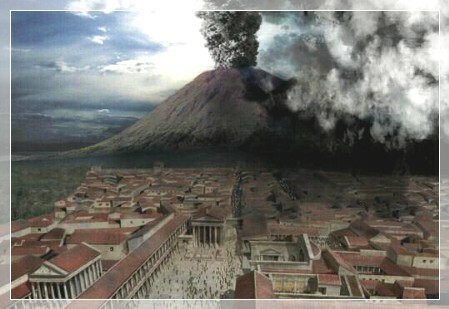 Vesuvius as it might have appeared before the eruption of AD 79. The upper reaches were densely wooded and the lower slopes were cultivated with vineyards and olive groves. Vesuvius as it appears today. The north-east side of the old crater is still visible, but a new cove has formed to the south. The volcano has erupted many times since AD 79, most recently in 1944.